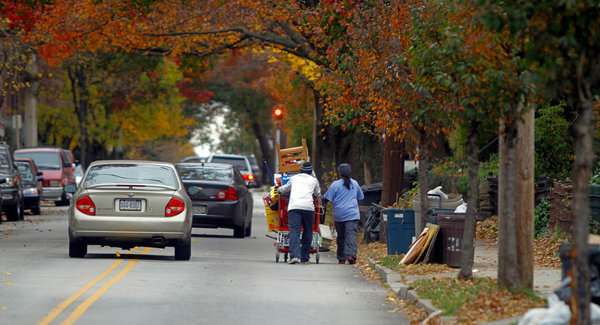 The Germantown area of Philadelphia was formerly considered solidly middle class but is now mostly low income. "Everything started going down in the dumps," a longtime resident said. WASHINGTON — The portion of American families living in middle-income neighborhoods has declined significantly since 1970, according to a new study, as rising income inequality left a growing share of families in neighborhoods that are mostly low-income or mostly affluent. Room For Debate: Rising Wealth Inequality: Should We Care? 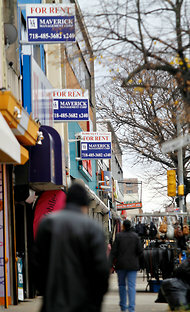 Many stores along West Chelten Avenue in the Germantown area are closed and for rent. The Northern Liberties neighborhood of Philadelphia is now described as middle class. The study comes at a time of growing concern about inequality and an ever-louder partisan debate over whether it matters. It raises, but does not answer, the question of whether increased economic inequality, and the resulting income segregation, impedes social mobility. The study — part of US2010, a research project financed by Russell Sage and Brown University — identified the pattern in about 90 percent of large and medium-size metropolitan areas for 2000 to 2007. Detroit; Oklahoma City; Toledo, Ohio; and Greensboro, N.C., experienced the biggest rises in income segregation in the decade, while 13 areas, including Atlanta, had declines. Philadelphia and its suburbs registered the sharpest rise since 1970. The isolation of the prosperous, he said, means less interaction with people from other income groups and a greater risk to their support for policies and investments that benefit the broader public — like schools, parks and public transportation systems. About 14 percent of families lived in affluent neighborhoods in 2007, up from 7 percent in 1970, the study found. The study groups neighborhoods into six income categories. Poor neighborhoods have median family incomes that are 67 percent or less of those of a given metropolitan area. Rich neighborhoods have median incomes of 150 percent or more. Middle-income neighborhoods are those in which the median income is between 80 percent and 125 percent. The map of that change for Philadelphia is a red stripe of wealthy suburbs curving around a poor, blue urban center, broken by a few red dots of gentrification. It is the picture of the economic change that slammed into Philadelphia decades ago as its industrial base declined and left a shrunken middle class and a poorer urban core. The Germantown neighborhood, once solidly middle class, is now mostly low income. Chelten Avenue, one of its main thoroughfares, is a hard-luck strip of check-cashing stores and takeout restaurants. The stone homes on side streets speak to a more affluent past, one that William Wilson, 95, a longtime resident, remembers fondly. “It was real nice,” he said, shuffling along Chelten Avenue on Monday. Theaters thrived on the avenue, he said, as did a fancy department store. Now a Walgreens stands in its place. “Everything started going down in the dumps,” he said. Philadelphia’s more recent history is one of gentrifying neighborhoods, like the Northern Liberties area, where affluence has rushed in, in the form of espresso shops, glass-walled apartments and a fancy supermarket, and prosperous new suburbs that have mushroomed in the far north and south of the metro area. Lawrence Katz, an economist at Harvard, said the evidence for the presumed adverse effects of economic segregation was inconclusive. In a recent study of low-income families randomly assigned the opportunity to move out of concentrated poverty into mixed-income neighborhoods, Professor Katz and his collaborators found large improvements in physical and mental health, but little change in the families’ economic and educational fortunes. But there is evidence that income differences are having an effect, beyond the context of neighborhood. One example, Professor Reardon said, is a growing gap in standardized test scores between rich and poor children, now 40 percent bigger than it was in 1970. That is double the testing gap between black and white children, he said. And the gap between rich and poor in college completion — one of the single most important predictors of economic success — has grown by more than 50 percent since the 1990s, said Martha J. Bailey, an economist at the University of Michigan. More than half of children from high-income families finish college, up from about a third 20 years ago. Fewer than 10 percent of low-income children finish, up from 5 percent. Copyright 2011 The New York Times Company. Reprinted from The New York Times, National, of Wednesday, November 16, 2011.